The River Esk provides an interesting grade 2/3 descent when there is enough water! The river may have some restrictions as to when it can be paddled but the middle section is rarely fished. Whillan Beck which runs down into Boot is a steep stream with lots of big drops, it is run from time to time but as the picture shows it need just the right amount of water, too much and there are some nasty traps! 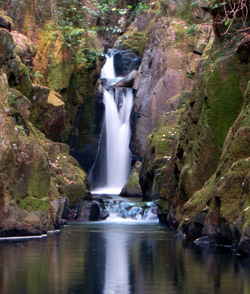 The rivers of Eskdale rise and fall rapidly. For current levels give Gareth a ring at Brook House Inn on 019467 23288. 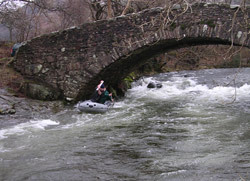 When there is enough water the Esk can provide an interesting trip in an inflatable canoe or small raft! If the central rocks are covered at Doctor bridge as in this picture then the river should provide a good run.